His comments came to some 1,400 members and guests of the Italian Parents’ Association during an audience at the Vatican’s Paul VI hall Sept. 7. Praising the group’s efforts promoting the family and education as guided by Christian principles, the pope invited them to always foster and build trust with teachers and schools. If it is all right to “complain about limitations” or defects when it comes to schools and teachers, it is also “imperative to treasure them as the most invaluable allies in the task of education, which you together carry forward,” said the pope, who taught high school students as a young Jesuit in Argentina. “To change this situation, someone has to take the first step, overcoming any fear of the other and generously holding out one’s hand,” he said. 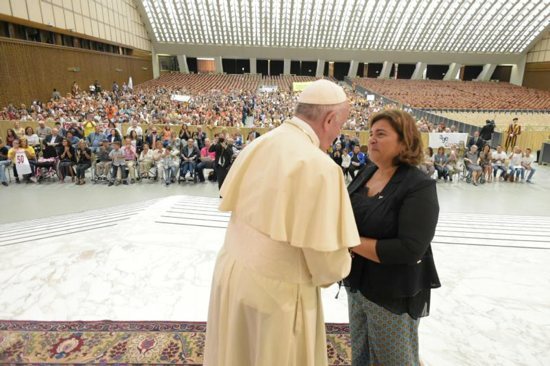 “That is why I invite you to always cultivate and foster trust toward schools and teachers; without them, you risk remaining on your own in your educational efforts and being increasingly unable to confront new educational challenges that emerge from today’s culture, society, mass media and new technologies,” the pope said. “Dear parents, your children are the most precious gift you have received. Remember how to take care of it with commitment and generosity, giving children the freedom necessary to grow and mature into people who will one day be able to be open to the gift of life,” he said. However, he told them, do not let their “vigilance over the dangers that threaten the lives” of children prevent them from being able to look at the world with confidence or from showing kids the best ways to grow as people, citizens and Christians. The pope said both parents and teachers need to teach kids the difference between good, not so good and bad, and help kids learn to make such moral and ethical distinctions on their own.